When a Galician friend told me that northern Spain is “basically like Scotland”, I didn’t think he meant it so literally. The region is known for its verdant landscapes, rocky shores, and unpredictable rainy weather, which you may not usually associate with Spain. 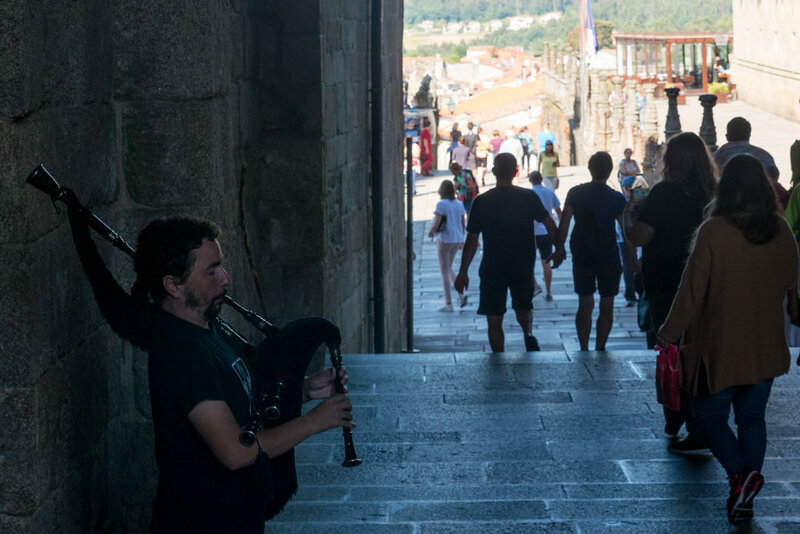 It also happens to have deep Celtic roots, and people even play the bagpipes. Now I find myself in a local dive in A Coruña, a city in the northwestern tip of Spain, where the bartender has just commenced an old Celtic incantation. As all the patrons stand quietly huddled around a large bowl, the bartender-turned-druid pours in aguardente from a large bulbous glass and then sets the spirit alight – all the while reciting spells imbuing the drink with powers to cleanse the soul and keep evil spirits away. 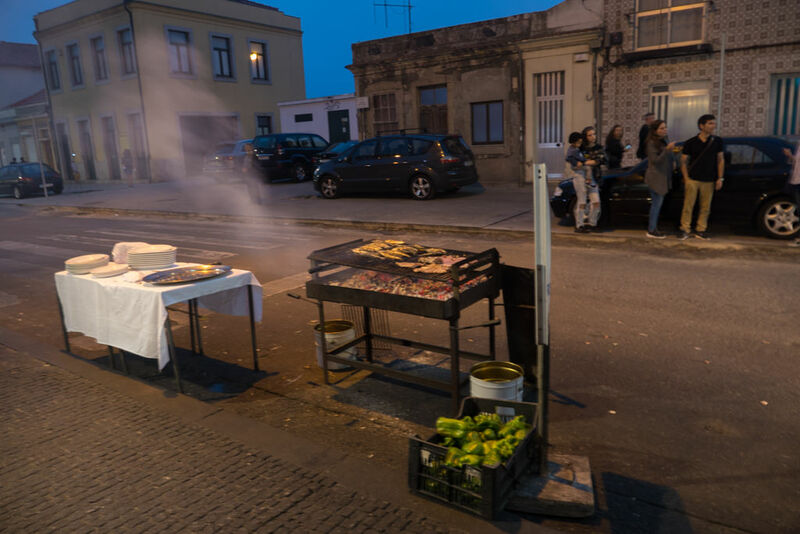 What I’m witnessing is the ritual of the Conxuro da Queimada which, more than just a party trick, seems to be a true Galician tradition. For the duration of the 20-minute ritual, the bartender perfectly straddles the line between sincerity and humour. He pours ingredients such as brandy, sugar, coffee beans and cinnamon into the bowl as he explains their powers, often with a lighthearted punchline (it doesn’t always register with my limited Spanish, but draws many laughs from the crowd). 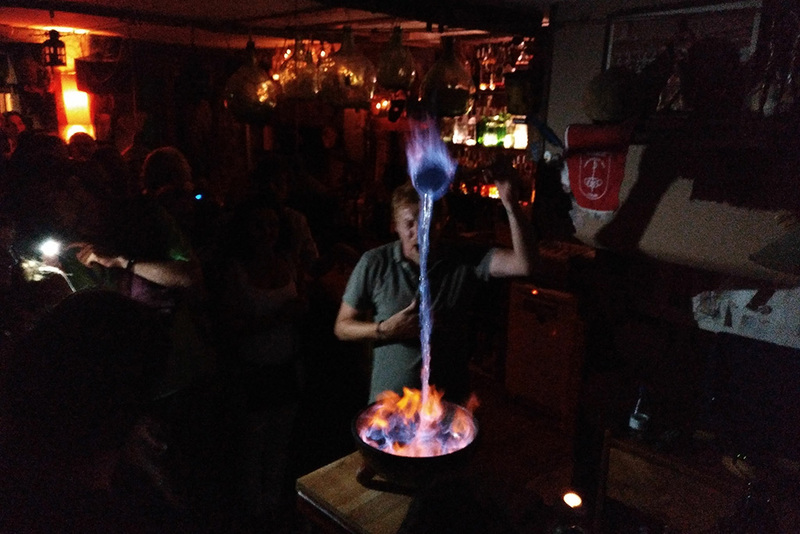 As the Queimada burns with a bright blue light in the darkened bar, he repeatedly ladles the burning concoction before pouring it back down into the bowl. The bar is mostly silent except when our priest exclaims in Spanish “let there be light!”, prompting all around to chant “LUME!”. Those in the front row are blessed with a touch on the head. Our master of ceremony calls out different countries of origin, and invites all those from all around the world to cheer up their hearts and be better friends. The drink is finally shared with all in attendance. The hot and herbey punch is meant to cleanse the spirit and bring good luck, which I genuinely hoped was true. As I took my sip from the bowl, I crossed my fingers. 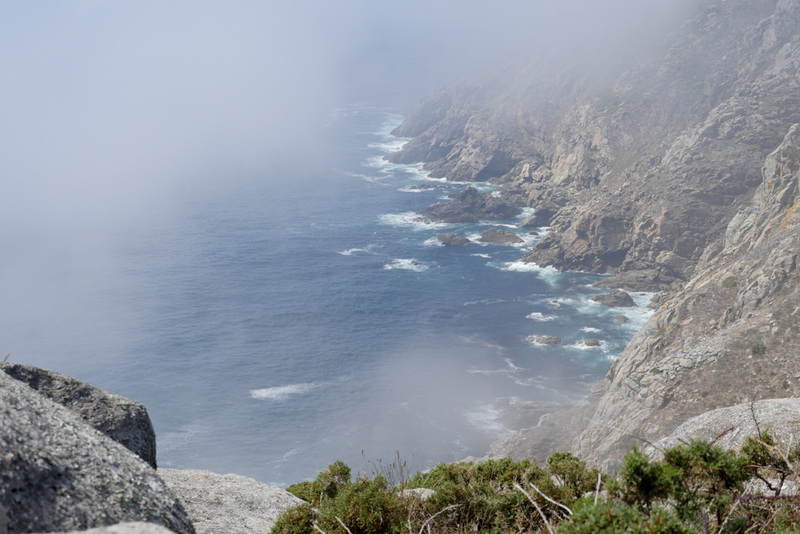 This is a story about Galicia, which is a wonderful part of Spain. 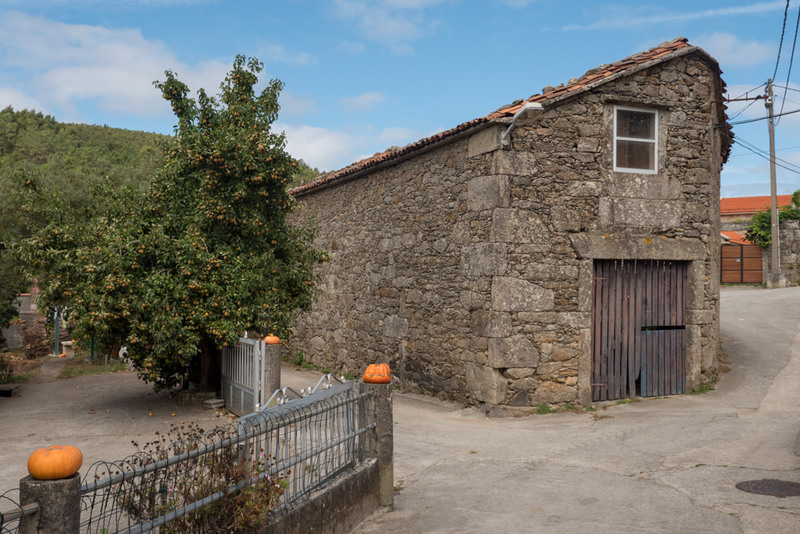 It is also a story about my trip in Galicia, which was an uncontrollable cascade of failures. Maybe it can be a lesson in how not to travel. But I should probably backtrack a little and start this at the beginning. My decision to go to Galicia was born mostly from practical considerations. It was August and I simply wanted to travel somewhere for about a week. 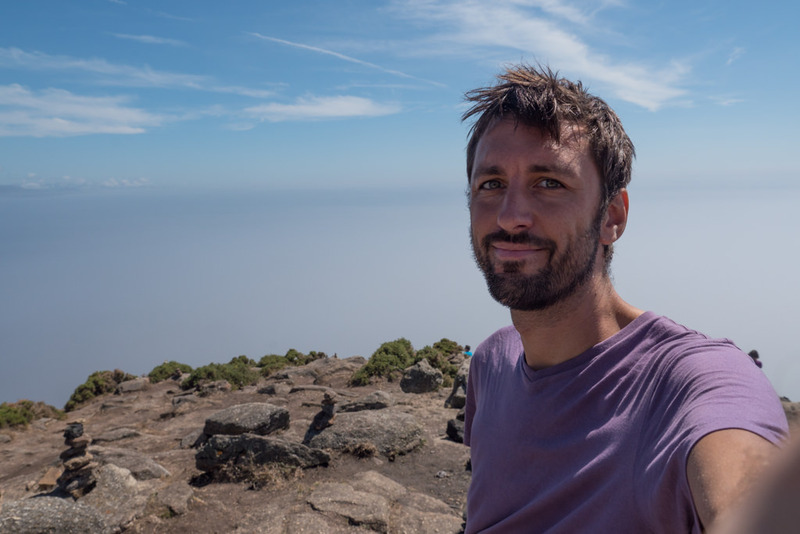 Travelling by plane is always very expensive in Europe during this time of year, so since I’m based in Lisbon I thought I’d simply travel overland to Spain. And since it was a searing 40 degrees Celsius in the popular south of Spain I decided to go to the less-visited but cooler north instead. I didn’t do much research. All I had was a picture of some mountain peaks that I had saved in my “Travel Ideas” folder two years ago. The Picos de Europa had long intrigued me, and so I thought I’d take a couple of trains up to northern Spain with the ultimate goal of hiking the Cantabrian Mountains. I asked a friend who used to live in these parts for some recommendations. Armed only with his email containing some bullet point tips, I went off to seek adventure. My trip was off to an annoying start. A t Lisbon station, I couldn’t get a train to Porto for another 4 hours because they were all booked out. This was actually on a Monday and on Portugal’s most frequent railway connection. But of course, this is August. Improvising as always, I opened the BlaBlaCar app and found a rideshare instead. Switching gears, I quickly left the station and headed to the BlaBlaCar’s meeting point. But shortly before departure the driver cancelled on me, so I had to backtrack to the station and wait for the first available train later that day. When I got to Porto much later than planned, I made my way to the bus station from where my bus to Santiago de Compostela would depart. And then… I missed my bus! I don’t think this has ever happened to me before. I had my bus reservation ready on my phone, I was on time and I was at the correct station, but I still let the bus pass me right by without me on it. Mind you, I did have some valid reasons: the bus carried branding of a totally different company than what it said on my ticket, it was parked at the wrong bay, and didn’t have any destination sign up. Normally in these situations I nervously check and double-check everything, but this always turns out to be a total waste of energy, so the supposedly wiser traveller in me told myself, “look, that’s clearly not your bus yet, so just chill and have a coffee”. While I was casually sipping my coffee and chatting with a friend on my phone, I just let the bus drive away – and it was the last one of the day. The clerk at the ticket booth got pissy at me, claiming that it said clearly on the ticket that I should have reported at his desk before departure, which was when he would have informed me of the correct bus to board. (It said so in paragraph 5, subsection B of the terms and conditions. We all read those, right?) At least he was willing to re-book a bus for me in the morning for no extra charge. Still, I was getting cranky, and my enthusiasm for this trip had taken a serious dent. 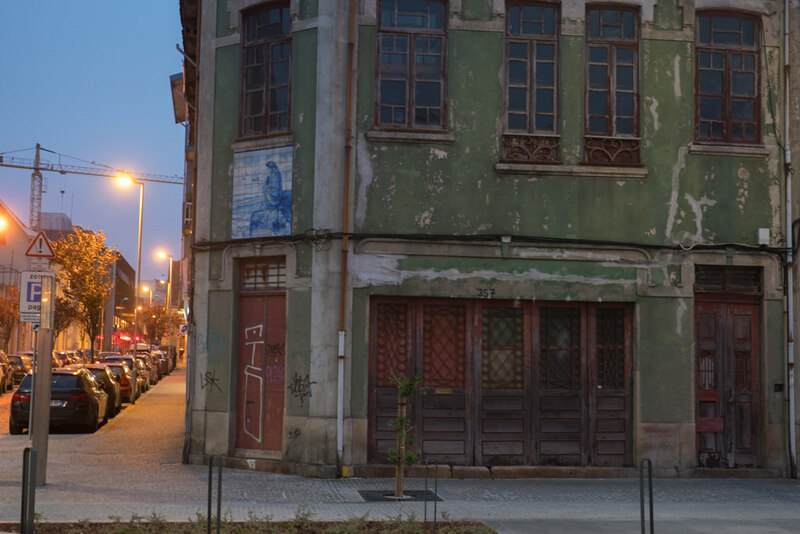 I now had to find a place to sleep in Porto, which proved to be an ambitious task. 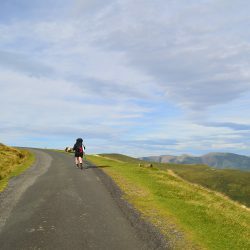 I checked five different hostels and B&Bs which were all totally full (oh hi there, August!). But finally I found a hostel on Booking.com that was on the outskirts of Porto and had one free bed. I jumped into a taxi and went straight down to claim it. When I got there, there was no bed. The hostel said they’d had problems syncing their system with Booking.com, so that last bed was already taken long ago. To my relief, the hostel was willing to improvise an extra bed for me by chucking a mattress on the floor of a shared room and hanging some sheets from the ceiling as dividers. At least I now had a place to stay the night. It was fine, really – any soft surface will do. I needed to fill my stomach and reflect on my frustrating day, so I asked the friendly receptionist for some good places to eat. 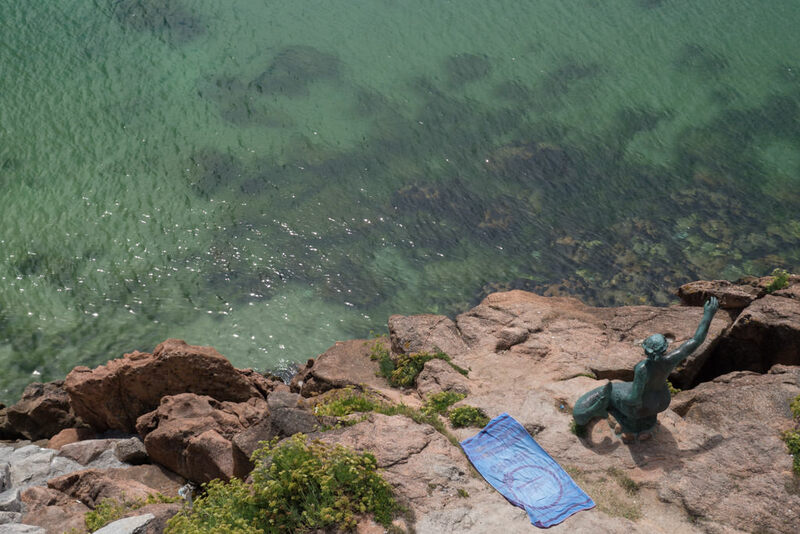 Instead of sending me into downtown Porto she pointed me to Matoshinos, a little coastal suburb of Porto. When I got off the metro there, it was clearly not an immediately charming place. I walked along rows of container cranes standing silently by a misty canal. I passed a gas station, some crumbling industrial buildings covered in grafitti, and a seedy-looking stripclub with a broken sign. I thoroughly questioned why the receptionist had sent me up this grimy nether-region of Porto, but then I turned a corner and was like, “ohhh, I get it now”. 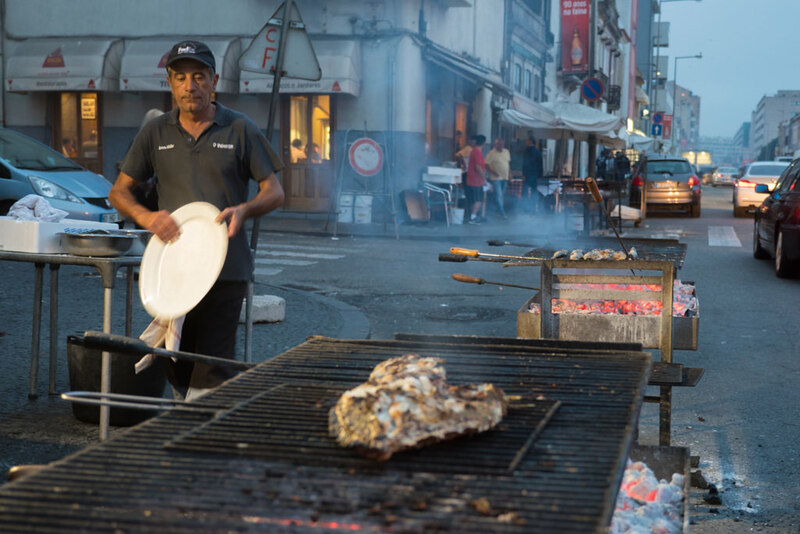 Here was a street absolutely filled with seafood restaurants, all serving fish delivered straight from the adjacent port, and all of them packed with locals. Every one of these restaurants had set up a grill outside where they cooked all of the bream, salmon, ray, and cuttlefish out in the open. This is just the kind of place I can get a kick out of. I happily sat myself down and ordered some fish and a cold beer, watching as the chef took care of my order directly in front of me. With the air filled with cooking smells and plumes of smoke rising from the grill stations all the way down the street, my thoughts drifted to Southeast Asia. For a moment I was back at some equally smokey street in maybe Bangkok or Manila waiting for some delicious street food to arrive. Eating in this totally local place (I didn’t see a single tourist) while daydreaming about journeys past put a smile back on my face. My journey to Galicia had been exhausting on this first day, but I went to bed with renewed spirits. It’s always nice to see the landscape gradually change from the window of your bus. We passed many pine forests and small rivers with moss-covered rocks. Around Vigo were large bays and lakes filled with wooden platforms, presumably there for fishing. 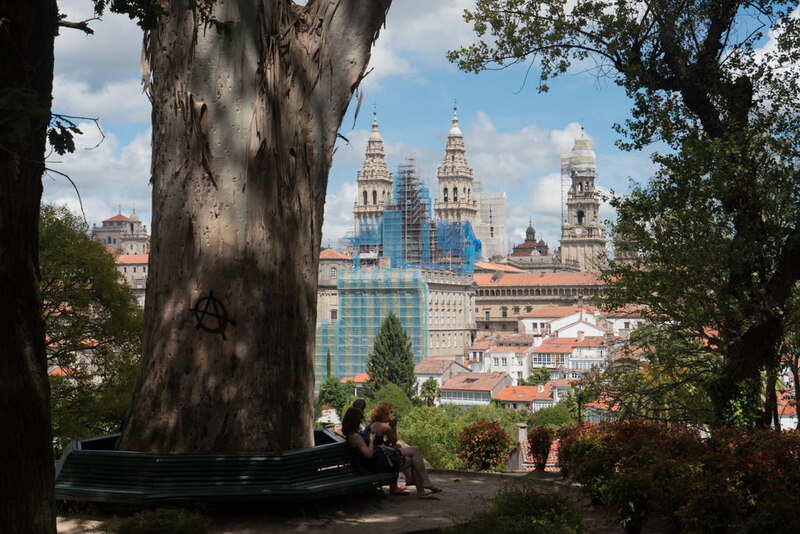 After many long hours I finally arrived in Santiago de Compostela, a beautiful old town that also happens to be the final point of the popular Camino de Santiago. I was not quite prepared for how much this town is defined by this pilgrimage route. There were people with walking sticks everywhere, many with bandages or patches on their legs. There were beggars asking for change so they could continue their walk. Places were selling massages and hearty breakfasts for hikers. Pilgrims were crowded around churches and squares everywhere. All this made me feel like a fake. 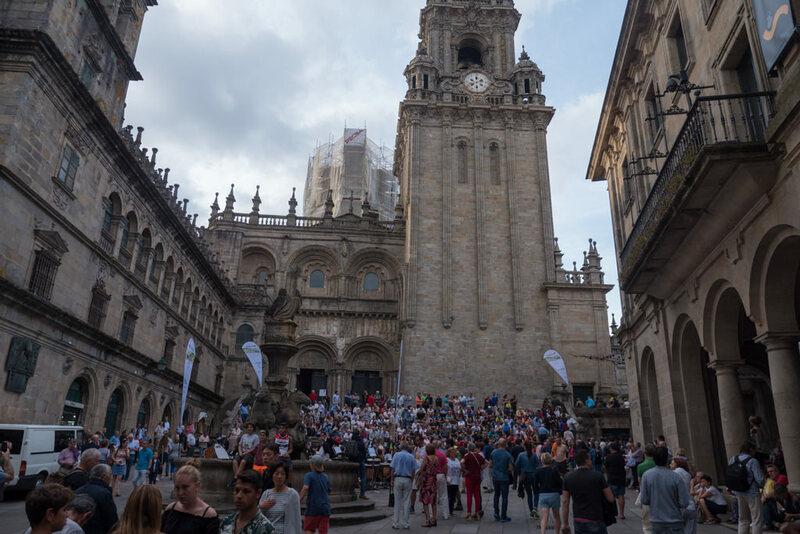 For all those people who walked for weeks or even months on end, no doubt suffering countless blisters along the way, Santiago de Compostela was their hard-fought and well-earned reward. I had merely parachuted in. I walked around and saw some of the sights. 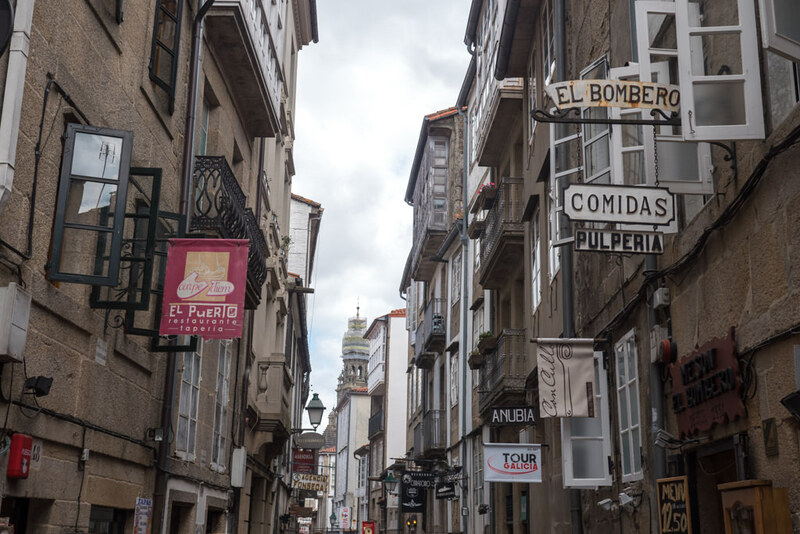 Santiago de Compostela is undeniably beautiful, but while I pushed myself through the crowds the voice in the back of my head started questioning why I’d come here. In the evening I met up with a local via CouchSurfing, with whom I went to see a wonderful open air jazz concert inside the old town. Later we shared travel stories over some local beers at a hidden bar overlooking the river, a place that I would have never ended up in without someone showing me around. It’s why I always love meeting people through the CS community. Still, I wasn’t quite feeling the vibe. I went to bed thinking that I should probably head on to the city of A Coruña, and make this my base for exploring Galicia. But the winds weren’t in my sails in A Coruña either. Shortly before my arrival my Airbnb host cancelled my reservation. Apparently it was an accidental double booking. “Sorry, August is crazy,” he said. Ugh. I again had to scramble to find alternative arrangements. And when I planned out my next steps, I found more obstacles on my way. 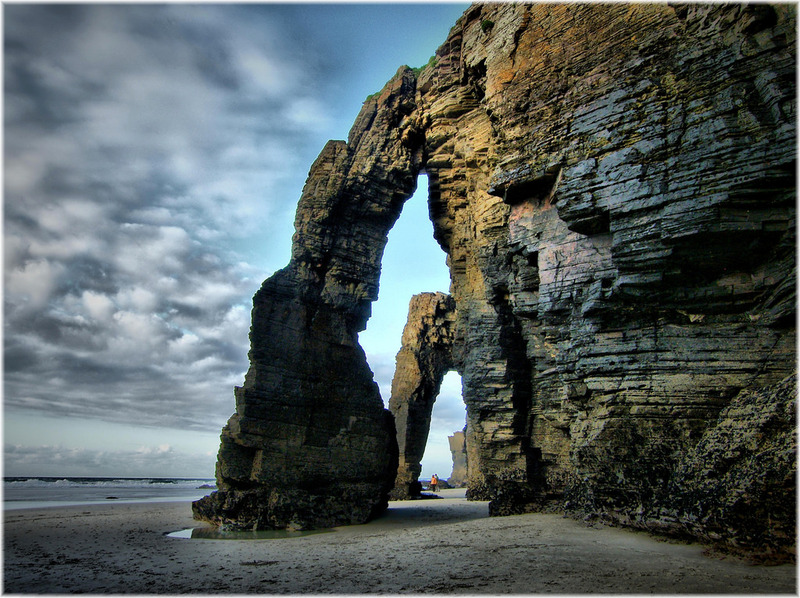 On Atlas Obscura I had read about the Cathedral Beach, where at low tide you can walk along its craggy cliffs and underneath its many naturally formed arches. I was looking forward to walking around this unique place and taking some cool photos there. Just one problem: you can’t reach this beach by public transportation. So I searched for a cheap car rental and eventually found one and booked it for the next day. I even looked up the tide tables so I could be there at the correct time. But then I discovered you actually need tickets to go to this beach! What is this madness?? I’ve never had to buy a ticket for a beach before. I tried to reserve one but, of course, it was all booked out for the next two weeks. 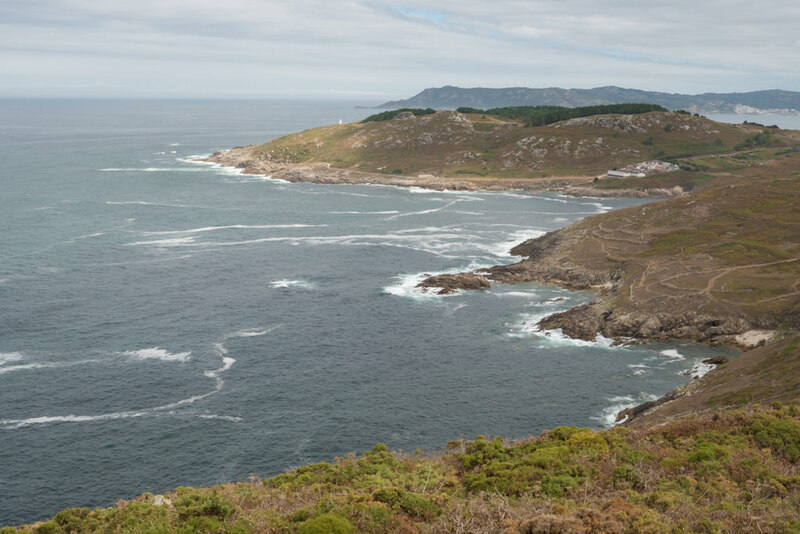 As an alternative, I was keen on visiting the Cíes Islands, often called Galicia’s greatest treasure. But guess what? Yep, you need a special reservation for that too. Feeling discouraged, I decided to do some sightseeing in A Coruña instead. I rented a bicycle and simply followed the coast. 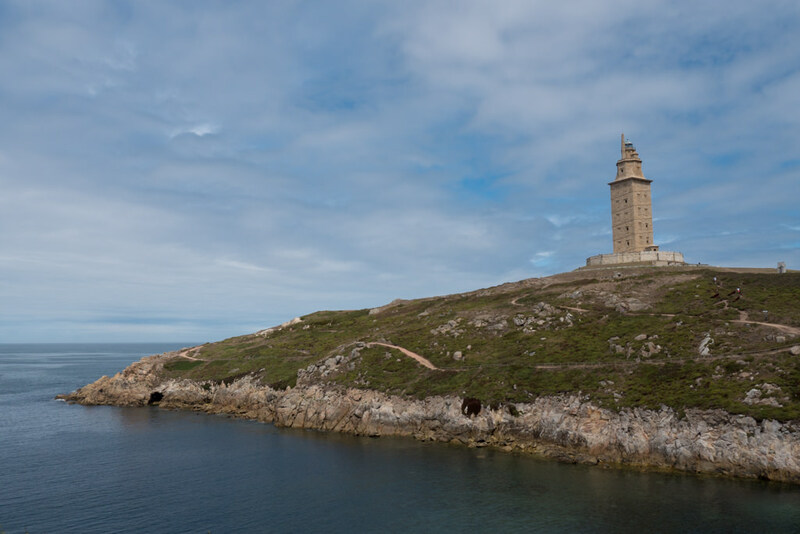 There, along the bay of A Coruña, an ancient Roman lighthouse watches over the ocean. 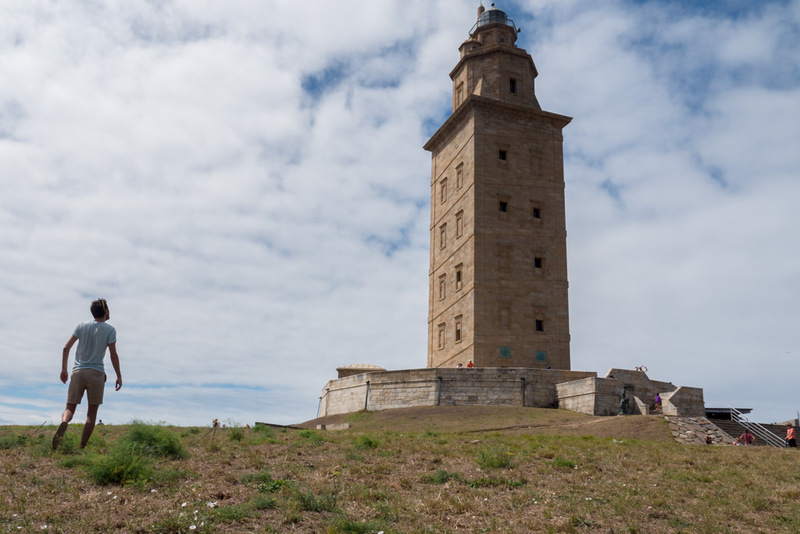 The Tower of Hercules was part of a network of dozens of such lighthouses around the Mediterranean and Atlantic coast. Built in the 2nd century it’s the oldest Roman lighthouse in use today. It struck me as remarkably well-preserved, until I read that it was renovated in 1791. Nevertheless it’s an impressive UNESCO-listed historical site and a wonderful landmark. I cycled further along the coast, passing some old fortresses and green hills. I genuinely enjoyed this little trip along the ragged coastline, stopping only to indulge in some nice tapas. 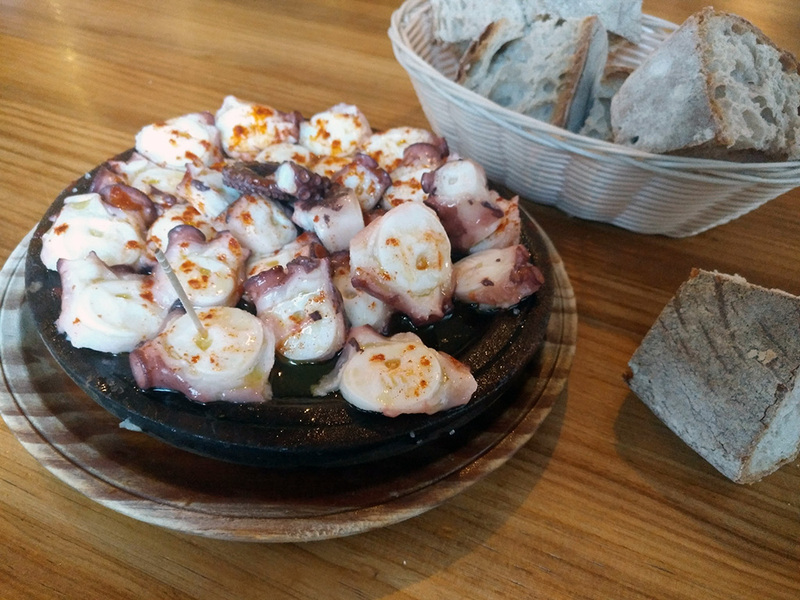 In the evening, I followed a friend’s recommendation by going for some Pulpo Gallego (Galician Octopus) at A Nova Lanchiña. I’m normally not a fan of the rubbery texture, but this was some of the most tender octopus I’ve tasted. The following day I still had my rental car, so even though I couldn’t go to Cathedral Beach, I figured I’d drive west along the coast. I went along the Costa da Morte (or the Death Coast), named so because there have been so many shipwrecks along its treacherous rocky shores. 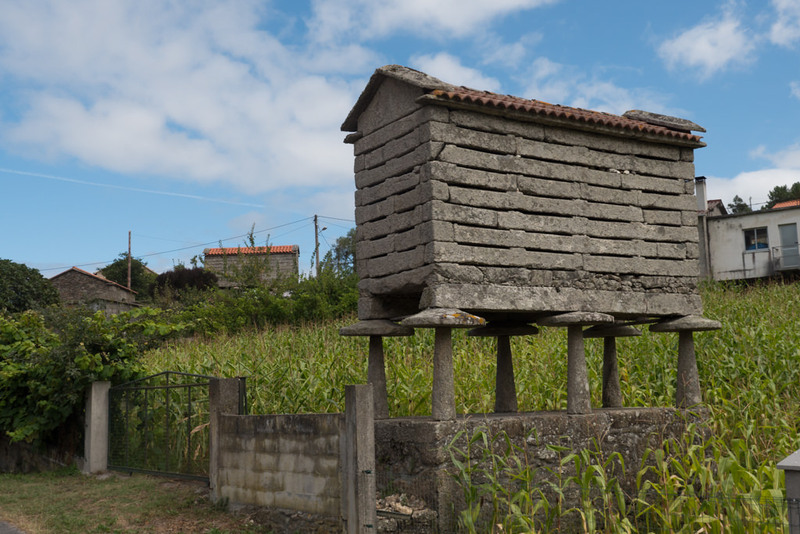 I passed some cute rural villages with lots of lemon and pear trees and where every house had a hórreo, an odd little granary built on top of stone pillars. None of this was super exhilarating. 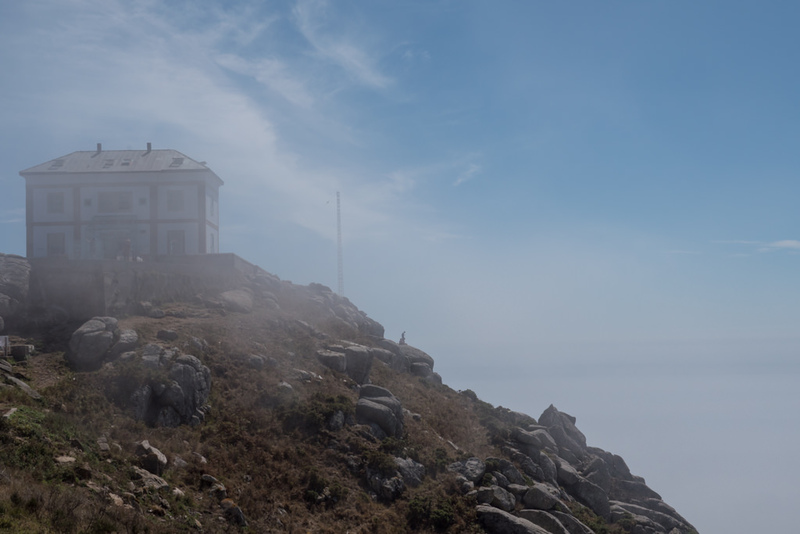 I went onwards to the town of Fisterra, which proved a lot more worthwhile. Before the Age of Discovery, this town on the westernmost point of Spain was believed by many to be the end of the world. Cloud cover gave the site a spooky atmosphere. 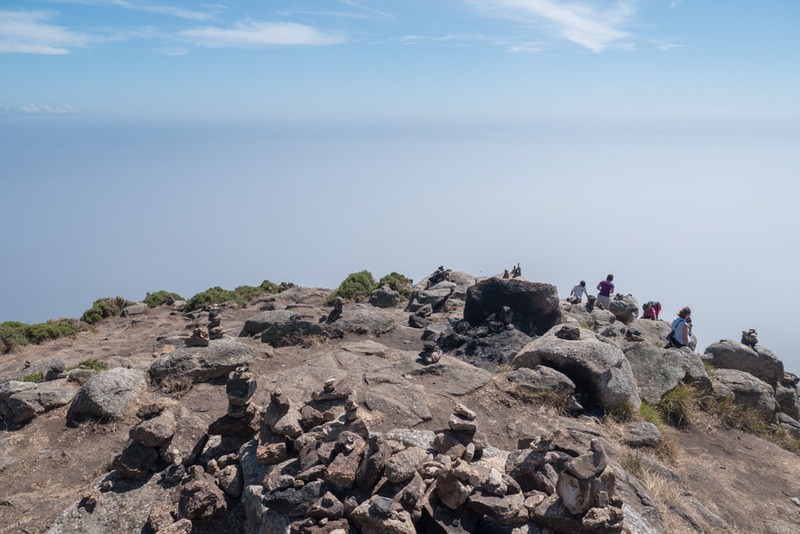 As a hiked around the peninsula I often couldn’t see the sea below, which did literally make it feel like it was at the end of the world. After spending some time here I backtracked to A Coruna where I met up again with some awesome people from CouchSurfing. A Coruna really comes alive at night, with a wonderful atmosphere around the funky bars and cute restaurants. Despite my hope that sipping the Queimada would give me renewed fortunes, the day after (Day 5 of my trip) I figured it was actually fine to go home. 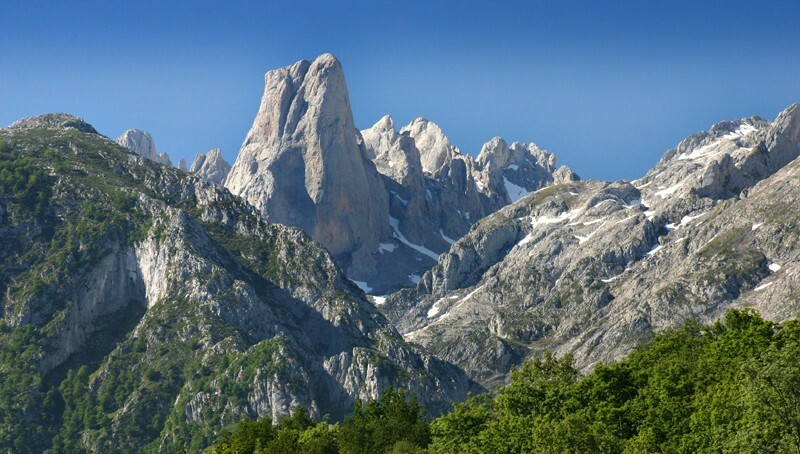 I was still keen on going to the Picos de Europa in neighbouring Asturias, but when it turned out it would be another 7 hour bus drive (instead of the 3 hour drive indicated on Google Maps), and when the only hostel I wanted to stay at was booked out, I just lost my motivation. Those mountains aren’t going anywhere, and now just seems a bad time to go. What I re-learned on this trip was that August is just an awful time to travel in Europe. 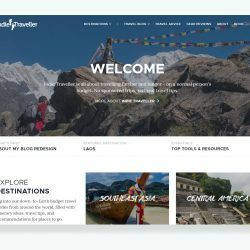 Everything gets booked out or is more expensive, making spontaneous and improvised travel a lot more difficult (especially in a region like this without much of an established travel circuit). I constantly felt like I was swimming against the stream and had to constantly struggle just to make basic arrangements. If these had been long-term travels I’d have pushed on, but there was no need to now. Of course, even though I made this into a story about how everything can go wrong, I still had a decent enough time in northern Spain. I met some cool people and saw a part of the world I hadn’t been to before, but it just wasn’t quite what I came for. Next time, perhaps during a different time of year, I might just book a direct flight to Bilbao and finish what I started. 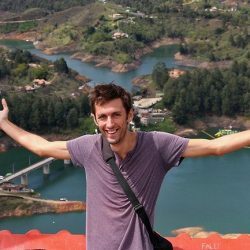 Hi, just wanted to let you know you did a great job on this blog. It stands out for the writing which conveys the real experience of traveling without the rose-colored spin most bloggers employ. It’s good to see someone who realizes that not everything has to be perfect for the travel experience to be worthwhile and meaningful. 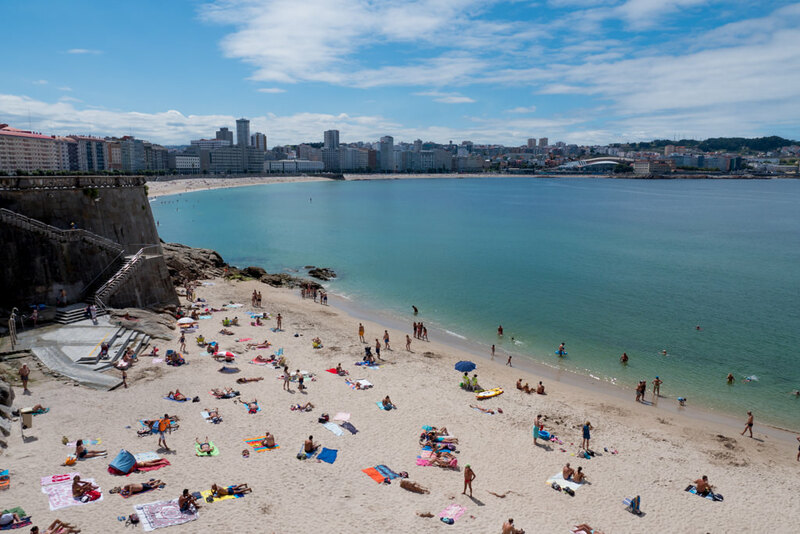 I will be taking my family to Galicia in August, and we’re being mindful to make all our reservations for accommodations and Cathedral Beach well in advance. Thanks! Hi Tony, thanks so much for writing this – really appreciate it as sadly these sort of takes tend not to be read very much (most people do prefer the rose-colored spin!). Galicia is obviously really amazing and with a bit more planning it’ll be such a great trip.